Akshay Kumar and Bhumi Pednekar are busy promoting their upcoming film Toilet: Ek Prem Katha. The actors were snapped at a promotional event at Andheri Sports complex in Mumbai on August 6, 2017. 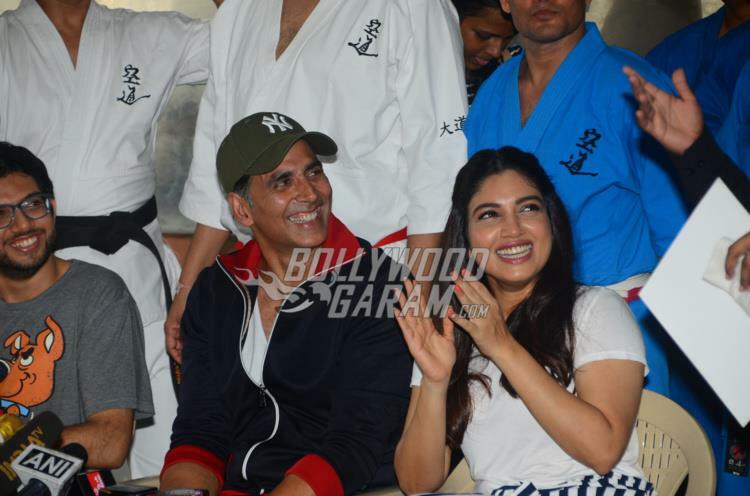 Akshay and Bhumi met the female martial artists at the promotional event which was also attended by Aditya Thackeray. The Khiladi star looked great in a white vest, and a track suit while co-star Bhumi was seen in a white top and a striped wide-legged pants. Akshay also Tweeted about the event and wrote, “Happy #FriendshipDay to all my amazing female martial artists!! All you ladies make me prouder than you can imagine #WSDC”. The upcoming film Toilet: Ek Prem Katha is directed by Shree Narayan Singh and is ready to be released in theatres on August 11, 2017. The story of the film is about the problem of open defecation in India. Akshay through the film will be promoting Prime Minister Narendra Modi’s Swachh Bharat Abhiyan which promotes cleanliness in the country.